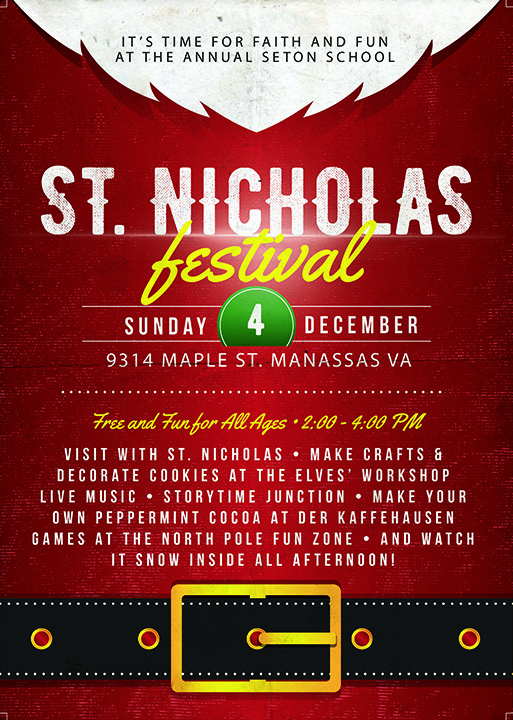 This Sunday – it’s the return of the annual…Seton St. Nicholas Festival! From 2:00 – 4:00 PM, bring the whole family to the Seton gym for fun, fellowship and faith! Come play exciting games and challenges at the North Pole Playground… Hear classic Christmas stories at Storytime Junction… enjoy flavored coffee and hot chocolate at Der Kaffehausen… Decorate ornaments for your Christmas trees, and make (and eat) delicious Christmas Cookies at the Elves’ Workshop… sing carols old and new at the Tannenbaum Main Stage… of course, don’t forget our special visitor… and just like last year, we promise it will SNOW in the Seton gym. Admission is FREE but canned goods, non perishable food items and new toys will be joyfully received and given to local food banks and the BARN. Want to help? Please email Matt Moore at: m@ttmoore.com or sign up by clicking the sign-up genius link below.